Businesses are looking at artificial intelligence (AI) as a truly disruptive technology, with the potential to change the way they run their organizations. Unlike many other new solutions, which are often adopted because of their promises to cut costs, companies are embracing AI so they can to bring new capabilities to their teams or to improve the support they provide to their customers and partners. 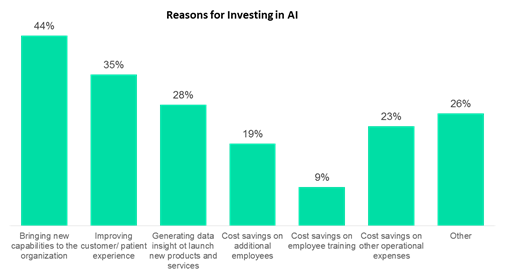 In a recent GlobalData survey, 44% of respondents that invested in AI indicated that they did so in order to gain new capabilities. Thirty-five percent (35%) made the decision in order to improve customer or patient support. These companies are visionaries, understanding that AI can impact so much more than the bottom line. This is good news, because it demonstrates that despite being in the early stages of the product lifecycle, companies clearly understand the technology’s vast potential. While many of the companies surveyed did expect to benefit from some type of cost savings, whether related to few hires, reduced training expenses, or other operational expenses, an impressive number were looking at the bigger picture. Clearly, companies want to do more and to do it better. And they want to harness the power of AI to help them get there. But, incorporating AI can be a daunting project for many. In the same survey, a sizeable 57% of respondents felt they were only moderately or slightly aware of the AI solutions available in their industry. Providers of AI solutions are taking steps to make the process easier for all involved. They are rolling out tools and solutions to encourage exploration and speed adoption. For example, IBM offers packaged solutions for building chatbots, incorporating visual recognition, converting audio or voice to text (or vice versa), translating text from one language or another, and understanding personality and emotions in text. These new solutions aren’t limited to language processing or other more straightforward, horizontal applications of AI. Major players are introducing tools to encourage adoption of AI even in the more complex areas through easily consumed machine learning (ML) and deep learning (DL) tools. This past fall, Microsoft and AWS launched Gluon, a new DL library that uses high-level APIs and pre-built/modular building blocks which enable developers to build and train their neural networks more quickly. And at the end of November, AWS announced Amazon SageMaker, a solution designed to make it easier and faster to build, train, and deploy ML algorithms. Google is also looking to make DL faster and more accessible. It’s new Tensor Processing Units (TPUs) speed up processing and can be used for training and running machine learning models on the Google Cloud Platform. Google claims that training which took an entire day using 32 GPUs can now be done using a fraction of a TPU pod in just one afternoon. Clearly, much is happening in the world of AI, and it is happening quickly – which is why over half of the professionals surveyed weren’t confident that they were up to speed on the latest solutions available to their businesses. But, there is no doubt that they need to get there. AI can and will have a profound impact on their company’s capabilities and market competitiveness. Previous postIs a Cellular-Enabled Tablet Enterprise Mobility or IoT?